The scariest thing about clipping for the first time is that the dog is convinced the clippers are going to kill him � so the most important thing to do first, is convince the dog the clippers are harmless. Run the clippers about a foot or two from the dog and wait for him to settle down and get used to the noise. When he does, praise him and move the clippers to the other side and wait until he�s used to them again. 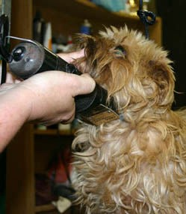 Spend about 4 � 5 minutes getting the dog used to the noise and the feel of the clippers, but use the tail end � not the clipping end to begin with. 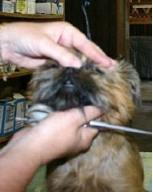 Let the handle end (while running) sit against the dog in various parts of it�s body and get used to moving the clippers all over the body and head (not too close to the eyes or mouth) � don�t attempt using the sharp end until you get no reaction to the running clippers. Remember, ignore the bad reactions and praise the calmer ones and you will eventually see a calm dog. The grip for clippers is usually like a holding a large crayon, but sometimes you can alter it to fit into tight places. Let the clipper do the work � don�t push it any faster than it�s happy to go, and drive it over the mid section of the back a fewl times, until you get the hang of it. Clip in the direction the hair grows. 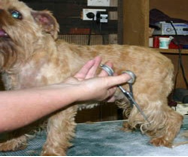 Only go over each area of the dog a maximum of two times when using the shorter #10 blade � if you do go over one area repetitively you may cause clipper rash Don�t try to get it exactly even � just get the worst off the body and top of head. This is what a rough clip off looks like. 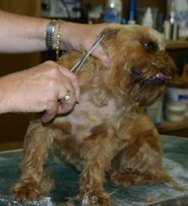 After the bath and blow dry, you can go over the dog with the clippers and smooth it off to your satisfaction. 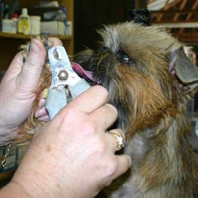 Change clipper blade to the number 10, and do ears in a downward fashion � both inside and out. 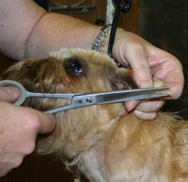 Then scissor the ear edges as you can�t easily get a clean finish with the clippers. 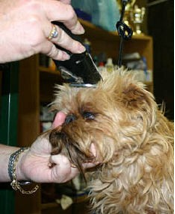 Brush or comb the area to be sure you are not cutting the dogs� skin, or ear edge. Next, scissor the legs down. Hold the foot firmly with one hand, comb the hair outwards, and close the scissors about an inch from the leg, facing the scissors in the same direction as the leg is, or directly against it � not crossways � that�s how to get �steps� instead of a smooth finish. Clip under the tail and around the private parts with the number 10 blade � go slowly and only go over these areas once, so as not to cause clipper rash. If you are not confident enough with the clippers, use smaller scissors and remove hair gradually. 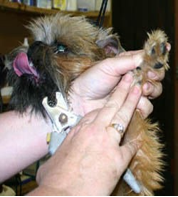 For the back legs, comb up and point scissors downwards, keep blades of scissors about an inch from the dog�s leg, only press hard enough to let the scissor do the work. Trim the feet, outside the toes and and turn the foot over and splay the feet so you can reach inside and be certain there are not knots or mats left after you�re done. The face is the most important part to keep clear of hair, especially around the nose and eyes. There is a very deep fold of skin that needs frequent trimming to keep short so it doesn�t build up any hair to stay and cause any long term damage to the skin from wetness problems. The hardest part is getting the dog to hold still and not worrying that you are going to cut or poke it in the eyes and cause injury. However, practice your grip and getting the dog to behave itself until you are sure both of you have built up some confidence. 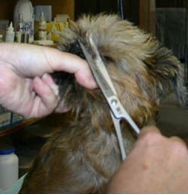 Get a hold of the beard with one hand, and with the mid section of the closed scissor blade, gently stroke the dog�s head, then place towards the dog�s eyes and slowly approach until the dog closes it�s eyes and you can stroke the shut eyes with the closed scissor blades without any struggle. This will take some minutes of practice. Stretch the skin on top of the head backwards, to open up the space so you can get the scissors very close and make the hair here as short as possible. 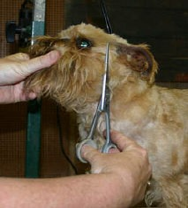 Be sure to leave no hair that is free to poke into the dogs� eyes and cause irritation. 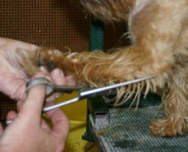 There are four toes with nails on the foot, and unless surgically removed at under a week of age, a dewclaw a little way up the front leg on the inside. Grip the foot and press one toe knuckle between your thumb and forefinger until the nail itself� extends�. 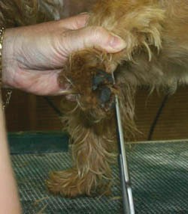 Look for the �bend� and exactly underneath that, on the bottom of the nail you will see the �seam� of the nail splits wider � don�t cut any closer to the dogs� toe than just immediately before the split closes. Slowly close the nail cutter until it is softly closed on the exact place you want to cut, and slowly complete the cut. Don�t swoop at it and guess. Have on hand (just in case you do end up going too close to the vein) some styptic powder, like Kwikstop. If you do happen to make the toenail bleed, press a pinch of styptic powder into the bleeding part and hold it for 2 � 3 seconds and it will stop. 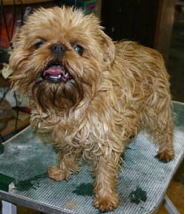 Griffons grow hair all the way down into their ears and this must be kept to a minimum. You can use your fingers, or eyebrow tweezers, or even small artery forceps � just don�t put anything further into the ear canal than you can clearly see. Use some powdered chalk on your fingers and the hair (to absorb the oiliness so you can grip the hair) and pull small amounts until the ear canal is entirely free from hair. Use a cotton wool ball lightly wet with a mild astringent cleanser, to wipe the inside of the ear clean from any grime. If this is not enough to clean the ear � then a trip to the vet may well be in order. Now a bath is in order, blow dry until entirely dry and re-clipper, re-scissor and you�re done!